Just what you have been waiting for… brand new luxury townhomes with 2 car garages! 5 different floor plans, with several featuring spacious first floor master suites. All plans include gourmet kitchens with granite counters, 9’ ceilings, and designer options galore…with prices starting around $300k, all brought to you by HH Hunt, one of the region’s most popular builders. With its sought after location right in the heart of the City of Williamsburg, Quarterpath residents will be able to literally walk to shopping, dining and banking at nearby Quarterpath Crossing shops. Nestled off the convenient 199 corridor, across from Kingsmill, Quarterpath at Williamsburg is adjacent to the new Riverside Doctor’s Hospital, and only minutes to I-64 or Colonial Williamsburg. 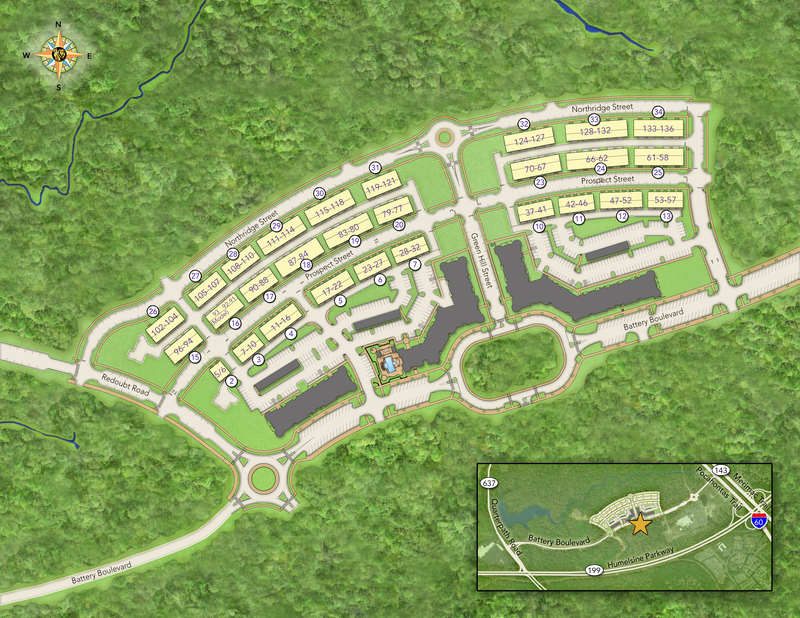 The pedestrian-friendly village concept is surrounded by 22 acre Redoubt Park and Tutters Neck Pond, with scenic walking trails and a pool and sun deck planned as part of future development. A combination of many factors makes this a unique housing opportunity in the local real estate market: HHHunt Homes’ innovatively planned townhomes; a highly desirable location in the City of Williamsburg; convenient access to I-64; and the pedestrian-friendly village plan for the community. Situated on 360 acres of picturesque, rolling terrain, Quarterpath will showcase two of HHHunt Homes’ architecturally distinct townhome designs, ranging in size from 1,867 to 1,981 square feet. Floor plans feature two or three bedrooms, 2.5 baths, gourmet kitchens, spacious family rooms, plenty of flexible space and attached two-car garages. A great selection of modern design options is available.Planned amenities include a resident clubhouse and a pool with sundeck. Quarterpath is ideal for savvy buyers desiring a vibrant backdrop for exceptional townhome living. Homes are marked by the same architectural charm found in historic Virginia towns. Residents can enjoy less home maintenance, energy efficiency and more free time with family and friends. Colonial Williamsburg, Busch Gardens and Water Country are just a few of the exciting day-trip destinations just minutes from Quarterpath. Golf enthusiasts can challenge themselves at Golden Horseshoe Golf Course and Woods Golf Course. Foodies have an eclectic selection of local restaurants at which to dine. Also nearby are the Village Shops at Kingsmill, Colonial Williamsburg’s Merchants Square, The Market Place Shops and more. What’s it like to live in Quarterpath ? I grew up in this area (well, York County, which is the next county over), and my husband, kids, and I love being in Williamsburg! We live in the Village at Quarterpath, which is one of the few communities actually in the City of Williamsburg, which means even lower property taxes than James City County. Our neighbors are great, we are about a mile from a hospital, 5 minutes off of Interstate 64, 5 minutes to Busch Gardens, and walking distance to Colonial Williamsburg (This was the biggest draw for us.) Whether you end up in our neighborhood or not, I really cannot say enough good things about living in this area. Except for seasonal allergies. 😛 Those might get to you because of how much blooms here! Residents have an abundance of local business, social and recreational opportunities: A local village green, scenic walking trails, a 22-acre pond, Quarterpath Park and Redoubt Park, top-notch medical facilities, the College of William & Mary, and art, cultural and historic venues.